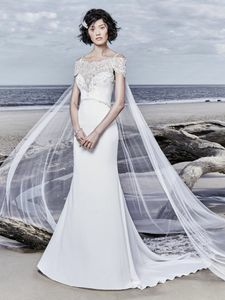 Description: Comprised of romantic and sophisticated Chardon stretch crepe, this sheath wedding dress features an illusion cutout train embellished in lace motifs. Beaded spaghetti straps complete the illusion sweetheart neckline and illusion scoop back, both accented in lace motifs. Complete with beaded trim along the waistline. Finished with crystal buttons and zipper closure. Detachable illusion train with cold-shoulder sleeves sold separately.